Maarten Baas has become the latest designer to foray into architecture, partnering with two teams of architects to unveil designs for a residential development in Eindhoven’s De Bakermat plaza. 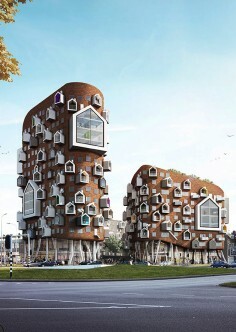 Baas is working with Dutch developer SDK Vastgoed on the new residential and commercial building, which will be located on a site that was previously awarded fourth place in the Netherlands’ top ten ugliest locations, according to the company. For his first venture into architecture, the Dutch designer has assembled two teams to work on the project, each of which brings together four architects from local studio Van Aken Architecten. “What fascinates me about the people in this profession is how they emphasise the practicality of each aspect,” said the designer, whose previous projects span furniture, lighting and installations. “Architects tackle things in a fairly rational and practical way, which is often diametrically opposed to my more intuitive approach,” he added. Team A’s proposal features a cluster of mismatched towers with pitched roofs, each of which has been constructed from different materials. One of the towers has balconies formed by protruding box shapes, while another bright yellow section has cartoonish, misshapen windows. Team B’s design is for two separate brick buildings, with gradually slanted roofs and house-shaped windows held in white frames, which extend outside the building’s exterior to form enclosed balconies. “I have encouraged these young architects to think and work in a freer, more playful way. I have been coaching both teams and guiding the creative process, getting people to kick around archetypes and suchlike,” he said. Each of the designs will be on display during Dutch Design Week 2015, which takes place from 17 to 25 October, and will be pitted against each other as part of a public vote. A jury composed of trend forecaster Lidewij Edelkoork, architects Jelle Houben and Douwe Boonstra, industrial designer Ruud Nordt, and SDK director Ferdinand Gremmen will also vote. Maarten Baas has become the latest designer to foray into architecture, partnering with two teams of architects to unveil designs for a residential development in Eindhoven‘s De Bakermat plaza. A winning design will be announced during the presentation of the Dirk Roosenburg Award on Friday 23 October, with the developers aiming to start construction in 2016. “All of us, both the architects and myself, were working far outside our comfort zones, which generated a nice degree of tension. And this is reflected in the result,” he added. Baas joins Dror Benshetrit, Thomas Heatherwick, Karim Rashid, Piet Hein Eek and Nendo founder Oki Sato in the ranks of successful designers expanding into architecture. Benshetrit recently told Dezeen that building design wasn’t restricted to just architects.